Douton Way to the back of the building handicap parking and ramp. Sewickley-born architect Thomas Wolf worked for the Heinz family, and visited France for inspiration. He designed this Gothic church as a “Parlor Cathedral”, as it is patterned after the cathedrals of Europe but at only 1/10th the size. See three of the largest Louis Comfort Tiffany stained glass pieces Louis Comfort Tiffany ever made. The vibrant colors and array of textures will surprise and delight. 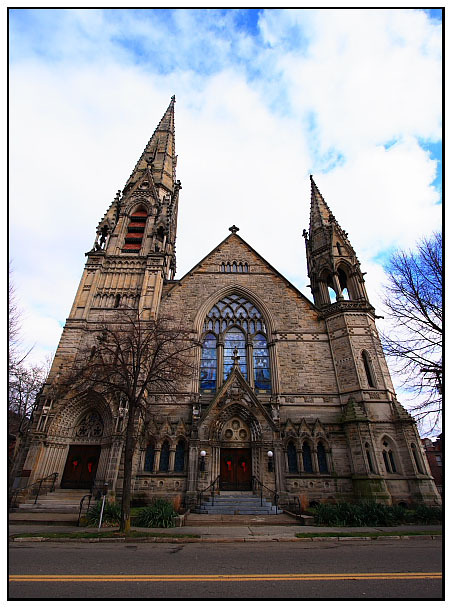 Calvary was opened in 1893, and is situated in the Allegheny West neighborhood of the Northside. It boasts a beautiful interior, complete with one of the largest Tiffany stained glass pieces ever made. The church has been designated a Historical Landmark.